Historic Fort Hamilton is located in the south western corner of Brooklyn, New York surrounded by the communities of Bay Ridge, Dyker Heights and Bensonhurst. The cornerstone of this coastal defense fort was set in 1825 and the first garrison flag was raised in 1831. While many of the original structures are gone, some having yielded to the construction of the Verrazano Narrows Bridge, part of the old fort remains on the grounds of the United States Army Fort Hamilton Garrison. Colonels Row, the Fort Hamilton Community Club, Lee House and the Harbor Defense Museum are on the National Register of Historic Places. The historic museum is located in the caponier of the old fort and is virtually untouched. HISTORY: Fort Hamilton, as constructed, was a quadrangle in shape. It was built of granite blocks, shipped to the site from quarries located in Yonkers, as well as with brick. On 1841, an engineer captain, named Robert E; Lee, was assigned to Fort Hamilton as Post Engineer. He served here until 1846. In the two World Wars, Fort Hamilton served as a major embarkation and separation center. At present, it is the only active Army post in the metropolitan area. In October, 1997, Fort Hamilton came under the command of the Military District of Washington. Fort Hamilton is also the home of the New York City Recruiting Battalion, the Military Entrance Processing Station, and the North Atlantic Division headquarters of the US Army Corps of Engineers. 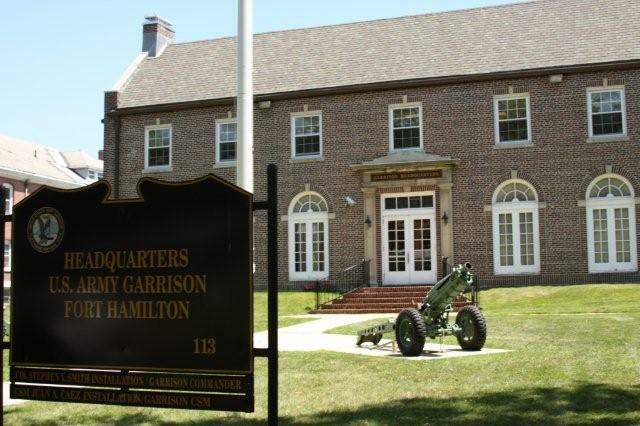 Fort Hamilton also supports many Reserve and National Guard units. MISSION: The US Army Garrison Fort Hamilton provides effective and efficient management of government resources to support mission readiness, improve infrastructure, preserve the environment, and enable the well-being and safety of service members, civilians, and family members. To make substantive and visible improvements to the quality of life programs and infrastructure, and to have the garrison viewed by residents, tenant organizations and the workforce as a proactive, responsive and customer friendly organization working hard in their interest to provide a safe and productive work environment. To serve as a power projection platform in the New York City Metropolitan area. POPULATION SERVED: Fort Hamilton is a very uniquely combined community comprised of Active Duty Army, Navy, Air Force, Marines, Coast Guard, Reserve Components, retired military, DoD appropriated and Non-appropriated fund employees, contractors, and family members. Fort Hamilton is home to the NYC Recruiting Battalion. Additionally, a great number of off post military, reservists, veterans and a large population of retirees also draw support from Fort Hamilton. No listings found for Fort Hamilton.